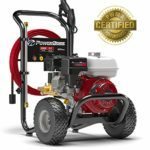 Maybe you’re running a small business pressure washing around your town/city, or you’re in charge of regularly keeping a lot of pavement clean… whatever it is, it’s time for a bit of that old-fashion petroleum gasoline powered pressure washing, so we’re digging into the best gas pressure washers on the market. 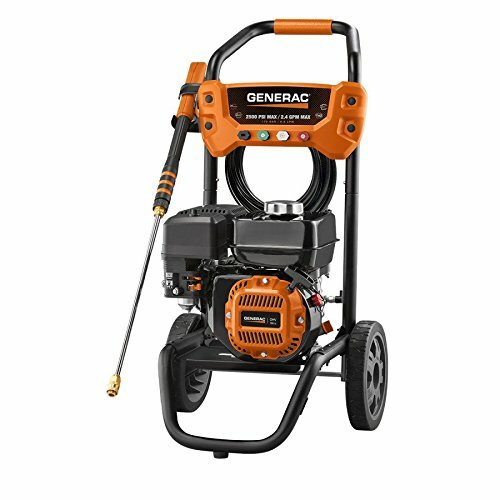 Where should I go to buy a pressure washer? Should I shop local, or online? 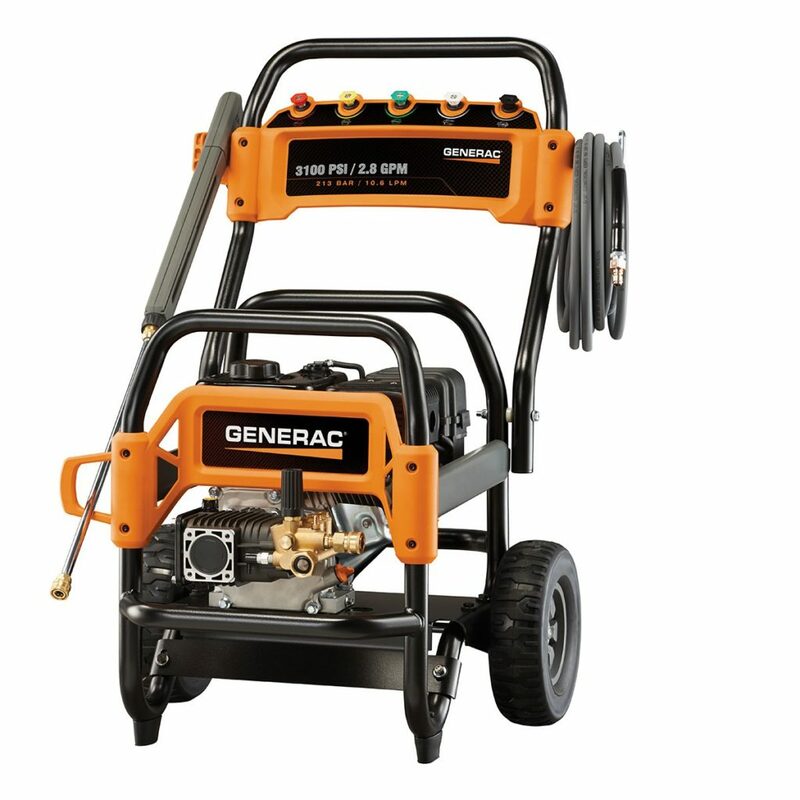 Probably the most important question of all is… where are you going to buy this pressure washer? 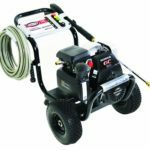 Because, the truth is, there’s no point in reading about the best pressure washers on the market, if you don’t have access to them at your local home renovation store. 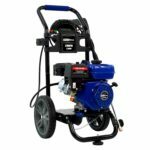 So if you have a specific shop in mind where you’ll be purchasing, then your best bet is to visit the place, get to know what pressure washers they have in stock, take some notes of makes and models and then come back and compare your notes to our selection of reviews for various pressure washer models. In that case, my best advice is to look for a Honda engine, since they’re well regarded across the board for being good engines that fire up on their first pull, over and over again throughout the years. They’re easy to find, cheap to replace, and if you feel inclined, you can often fix them yourself. 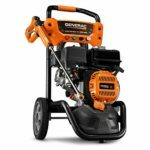 I’ve tried to make it easy by choosing a vendor we’re all familiar with (Amazon), which should be easily available to most of our readers and in some cases will provide free shipping, which… on a gas powered pressure washer (which means a full engine) you end up saving a ton of money there. For someone mechanically inclined, it shouldn’t take more than 15 or 20 minutes to assemble. It took me a bit to get the wand how I wanted it then it was smooth sailing. One simple ‘upgrade’ I recommend is to replace the plastic rivets with real/metal bolts if you’ll be putting this washer through heavy use. The Good: Easy to assemble, great pressure. 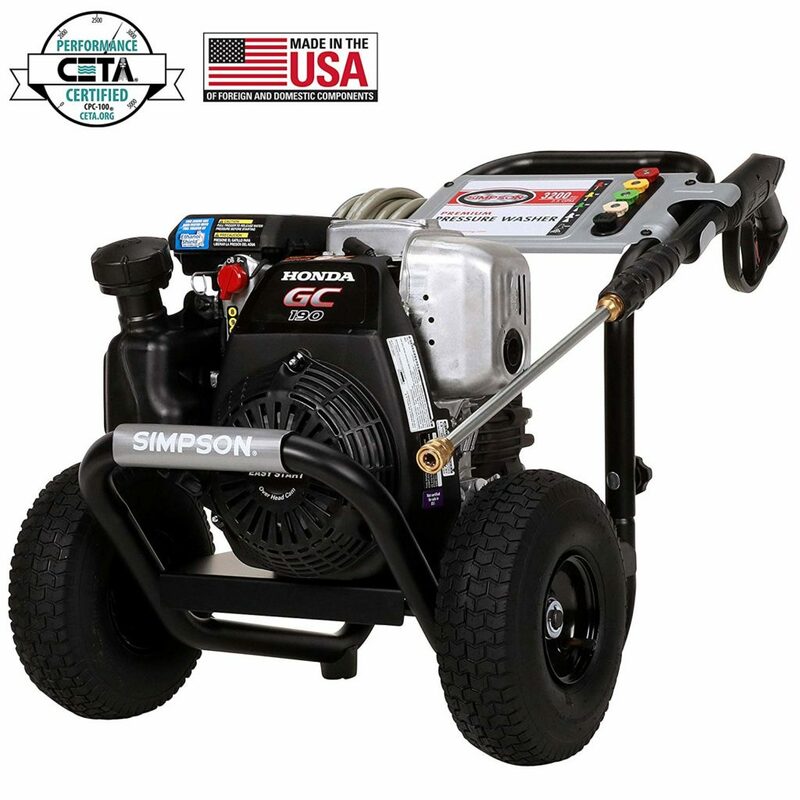 Great reviews, and is a best selling pressure washer. 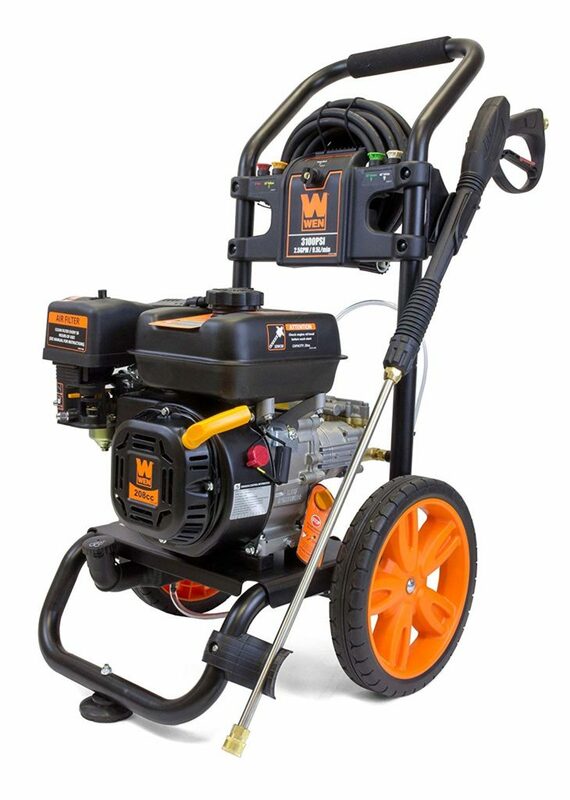 The WEN PW31 is a 3,100 PSI power washer and pumps that much pressure out plus more; powered by a 208cc engine, it translates to a cleaning power of around 7,750. The Bad: I didn’t find a need for the detergent tank. Have washed my truck, dirt bikes, and other vehicles many times. 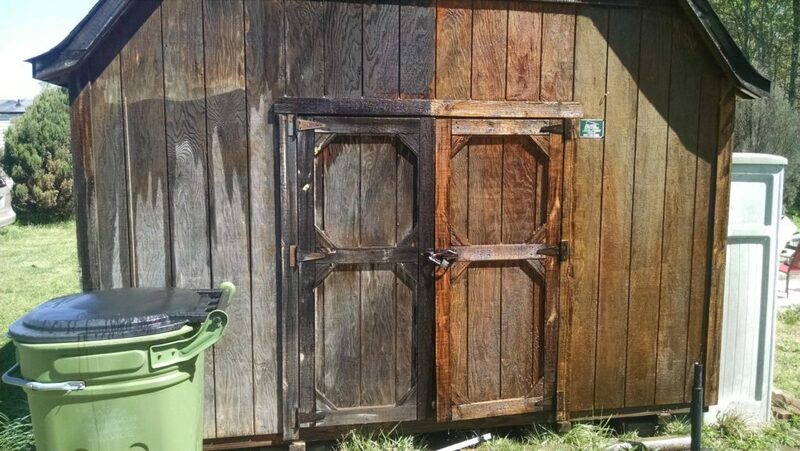 Cleaned what I thought was a permanent stain in my garage with it. I’m very pleased with this cheap pressure washer. The Good: Starts easily, cleaned my 5-bedroom house with ease. It arrived in a big box attached to a pallet. 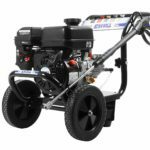 I found this pressure washer to have some of the best features & performance for the price. It comes with a bit of standard SAE30 oil, shipping weight was 150 lbs (68 kg), and it arrives mostly assembled. Turning down the pressure on your water will make this much easier to start. Turn the pressure to max once it’s running, and then turn back a half-turn to see if the pressure is sufficient. You’ll find this washer has more than enough pressure for even the most demanding jobs. The Good: Super fast setup, great pressure, easy to start, easy to do oil changes (recommended every 5 hours of use). The Bad: People complain of it arriving with gas or oil leaks. I suspect this is due to shipping. The pull/start handle is located in a weird spot. 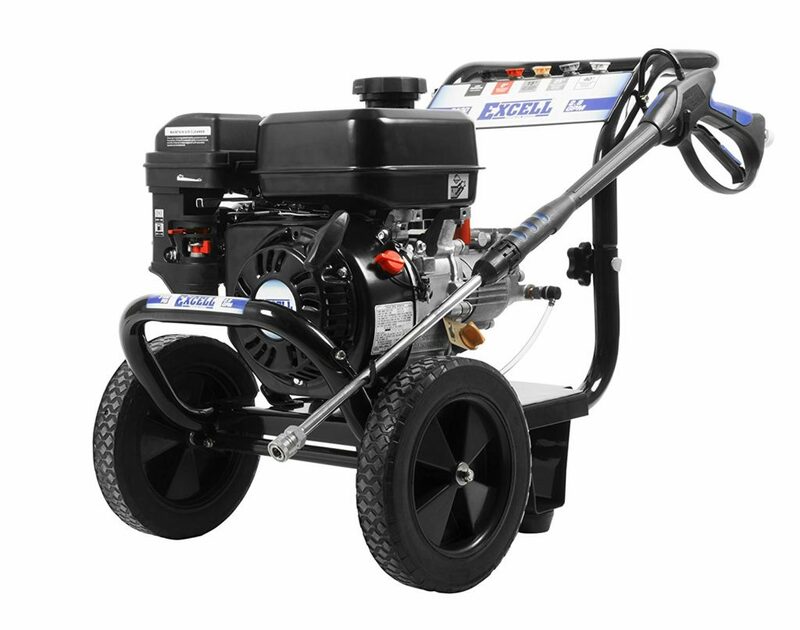 The name excell may not be a household name brand, but this is a mean little machine! 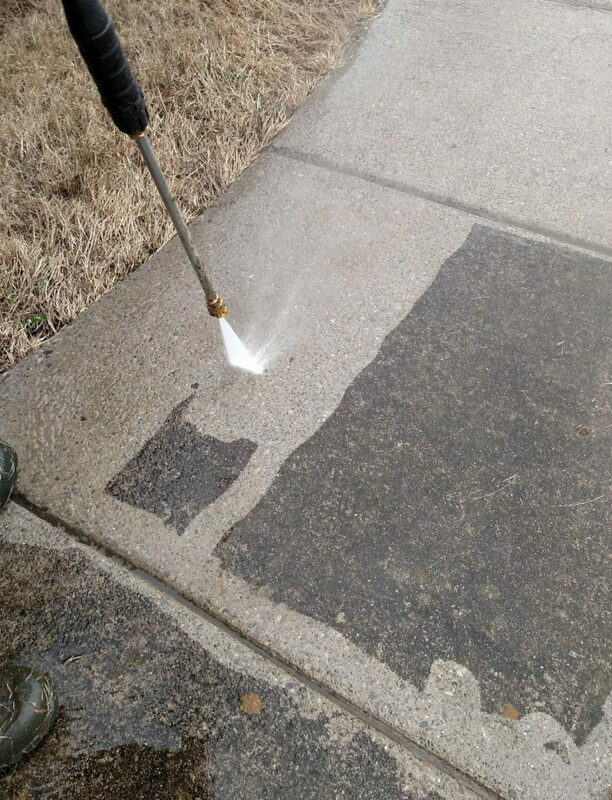 This pressure washer is great for around the house and it does what it is supposed to do. And even though it may not be a top name brand, as long as you maintain it properly & take care of it, it should last you a very long time. 3,100 PSI times 2.8 GPM, gives you a score of 8,680 cleaning power. The Good: LOVE this flexible motor mount to stop your washer from vibrating away from you like others do, comes with a high-quality brass pump, high cleaning power score. The Bad: Cheap, short 25 foot hose (7.6m), I used my own household hose instead, the wand seems really short (maybe 8 inches shorter than other similar pressure washers), and the melting hot muffler is right beside where your hoses attach. Added oil and gas and it fired up on the third or fourth pull. It’s got a reliable Honda engine which some people look for. If you’ve ever got stuck trying to pull-start a 10-year old cheap engine, you know the difference a brand name like Honda can make. The Good: Really enjoy how easy the Honda engine’s turn over when you fire this girl up. Good quality hose, and wand. The Bad: The sheet that the engine is mounted to flex’s when you start the engine, and could be sturdier. The manual says to check the air filter for oil contaminants which makes me think that’s a common problem for this machine, but mine was fine. 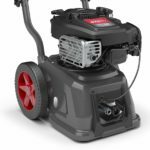 Briggs & Stratton are well known in the power washer industry, largely in part because they use Honda engines, which are known for how easy they are to start. 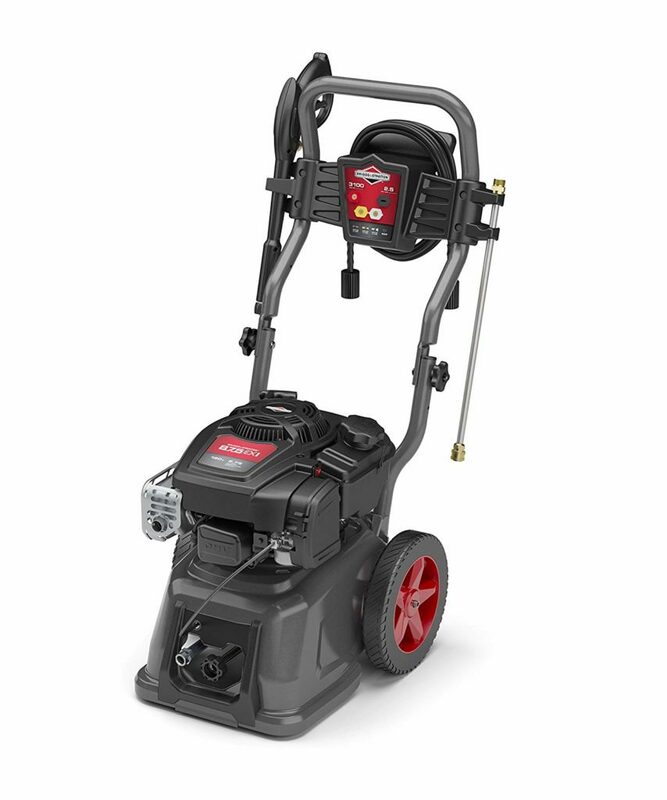 Typically, this pressure washer fires up on the first pull… thanks to that Honda engine. The Good: Honda engine starts right up on the first pull. Well built, fairly quiet as it idles. Light enough to lift into my truck on my own. The Bad: They seem to have rough shipping, so check to make sure you have no oil leaks when yours arrives. I didn’t use the detergent with it. 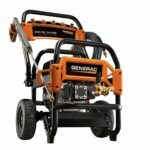 The Generac 7019 OneWash I got shipped fired up on the first pull which is a good sign, even for a brand new pressure washer. 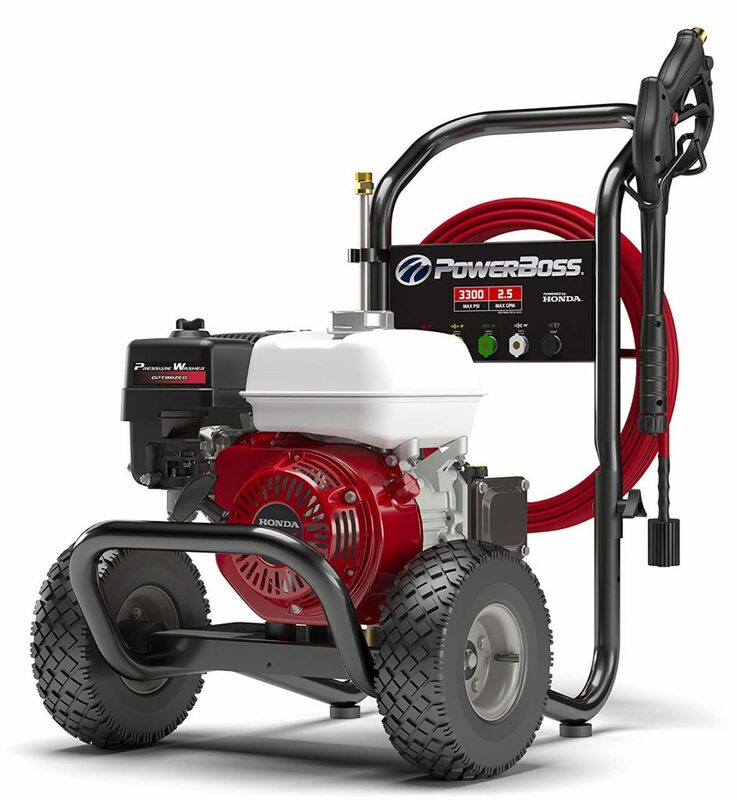 It’s a good pressure washer for the heavy-duty home user, but if you’re running a business I think there are better machines for the money. The Good: Easy start, I like the how they present the selectable pressure, smart nozzle storage setup, and it’s easy to assemble. The Bad: Suction tube gets in the way (zip ties to the rescue! ), Outdated customer support model (ie. having to wait for backordered items, etc) isn’t good for the modern customer. The hose is beside the muffler, very easy to have the hose touch the muffler and melt. The Simpson MSH3125 MegaShot ships with a Honda GC190 which is a well respected engine that never stops running. 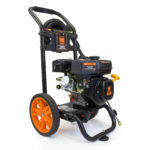 If you need a powerful, sturdy & reliable pressure washer, don’t hesitate to buy the Simpson MSH3125-S. 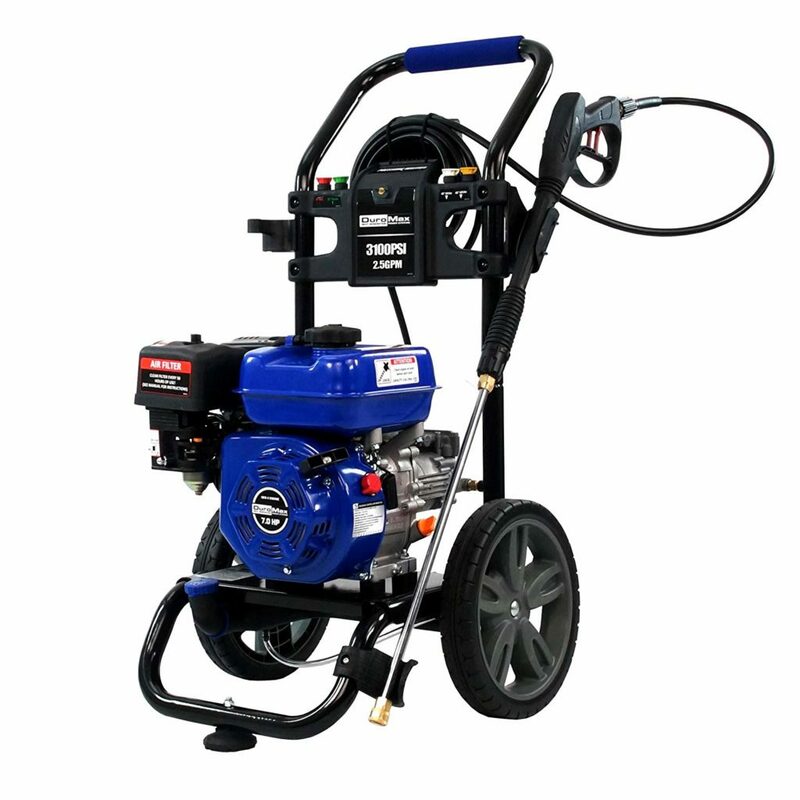 Even though it’s the last on our list, there’s a reason it made our list of best gas pressure washers in the first place! The Good: Sturdy Honda engine, loved by many. Compatible with a variety of aftermarket accessories, available from your local hardware store. The Bad: No detergent tank (I actually prefer this! ), I found the 25-degree nozzle wasn’t powerful enough, and the 0-degree was too powerful for around the yard.